Ginkakuji, officially named Jishōji, is a Zen temple located in northeast Kyoto. 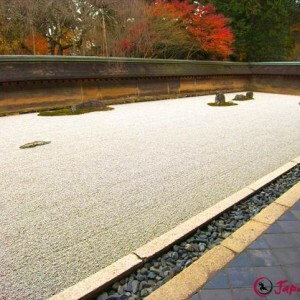 It was founded in 1490 by Ashikaga Yoshimasa, the 8th shogun of the Ashikaga shogunate. 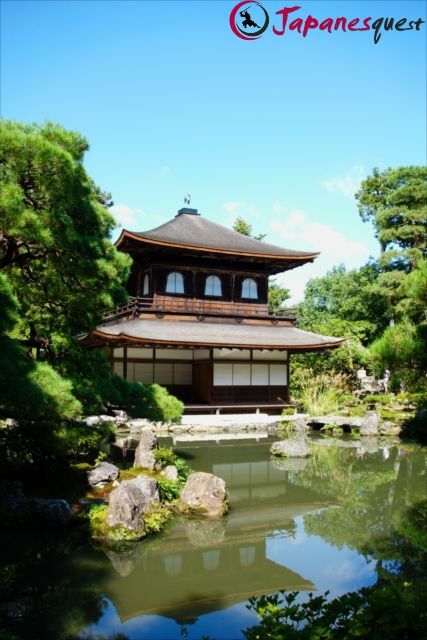 The temple and its garden are considered one of the best examples of Higashiyama culture, and it even became a UNESCO World Heritage Site in 1994. 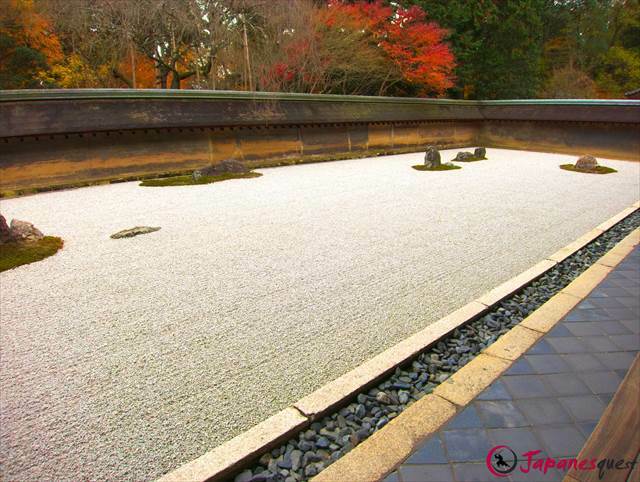 To understand the true beauty of Ginkakuji, one should first learn the idea behind Wabi-sabi. 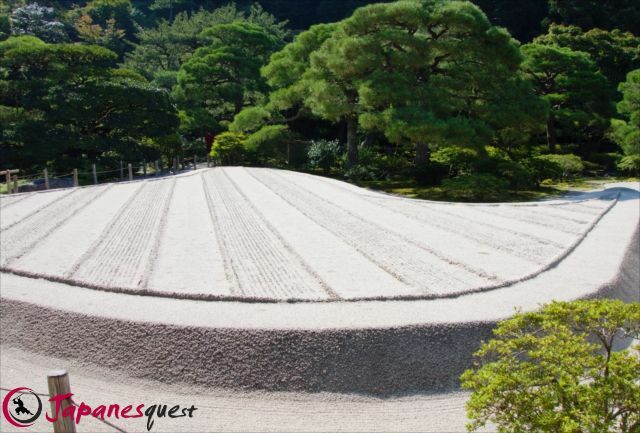 Zen garden of Ryōanji. Built during the Higashiyama period. 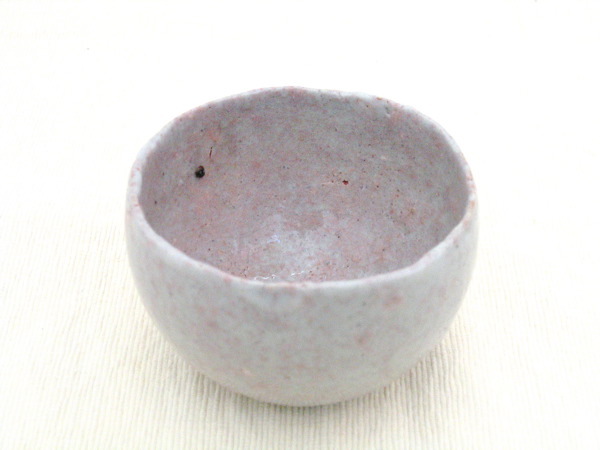 Modern tea vessel made in the Wabi-sabi style. 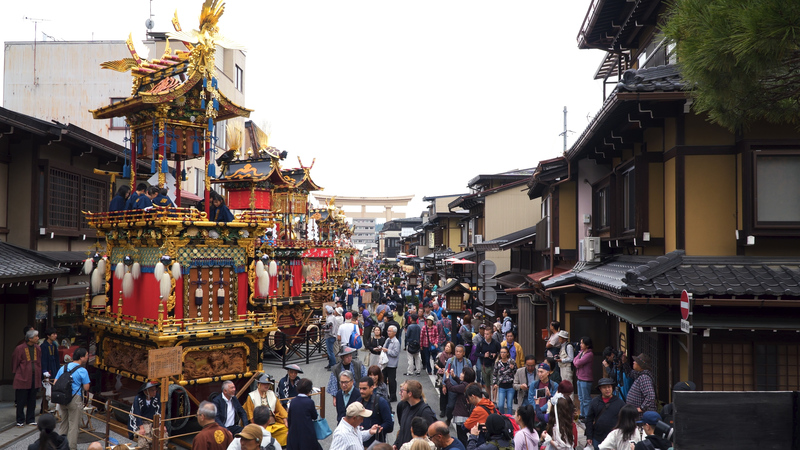 Unlike the 14th century Kitayama culture – where only the aristocrats could appreciate luxury and extravagance – the Higashiyama culture, which values the beauty of simplicity, spread from the upper class to average citizens in the 15th century. As you pass the central gate, you will encounter Ginkaku – one of the best examples of Wabi-sabi. 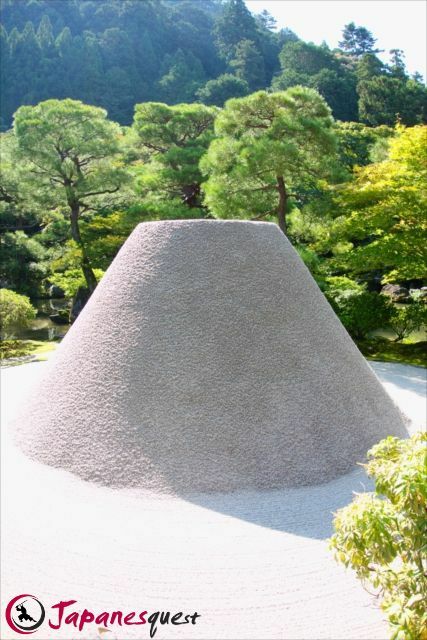 It is also what “Ginkakuji” stands for. While it is not sumptuous, Ginkaku shows a high level of tranquility and beauty within its landscape of trees and the pond. Amidst its many features, you can also find a statue of the phoenix, a guardian of Kannon (the goddess of mercy), on its roof. 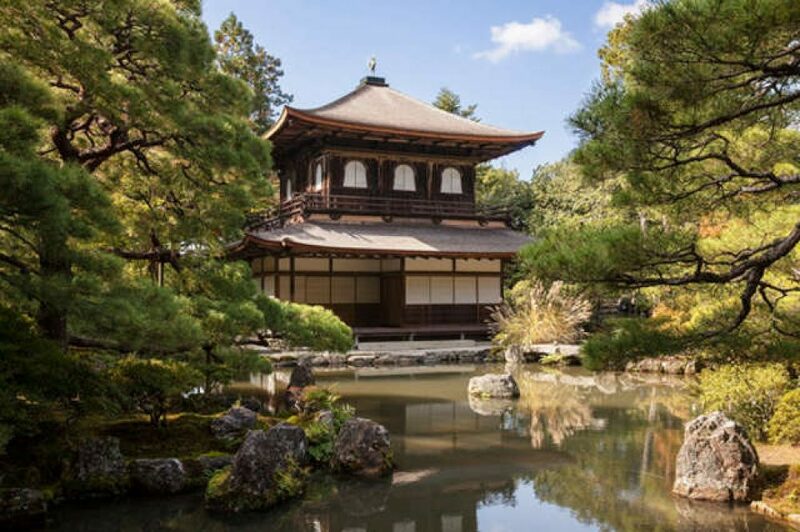 Ginkakuji’s Japanese garden is another fine example of Wabi-sabi. 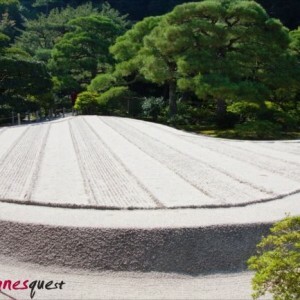 The sand garden with stripes is called Ginshadan, and the sand mountain next to it is called Kogetsudai. 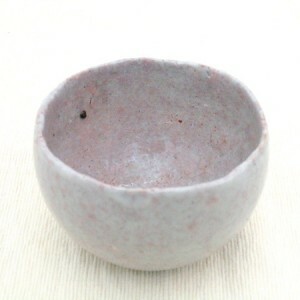 The Ginshadan represents one of the Fuji five lakes, and the Kogetsudai represents Mount Fuji itself. 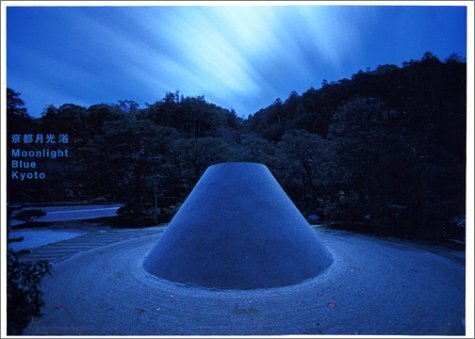 Ginshadan also has the role of reflecting light at night. After dusk, the moonlight gently covers Kogetsudai and Ginkaku. 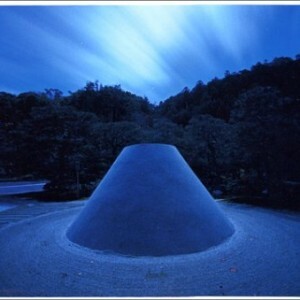 Note: Unfortunately, Ginkakuji is not open to the public at night. Up the hill from the Japanese garden, you can find a small observation deck with a spectacular view. You can see Ginkaku, the Japanese garden, and the main hall of the temple, while the whole city of Kyoto is also spread out in the distance. 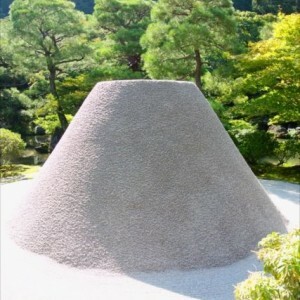 Ginkakuji is sometimes thought to be archaic and obsolete when it is compared to Kinkakuji. 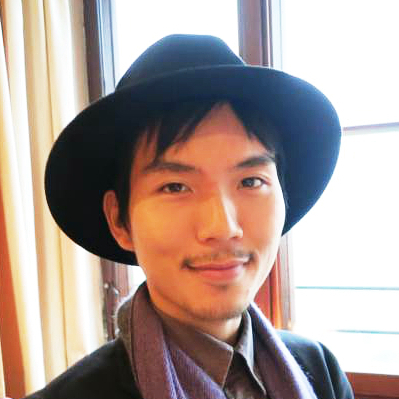 There is, however, a unique Japanese aesthetics called Wabi-sabi that lies within. 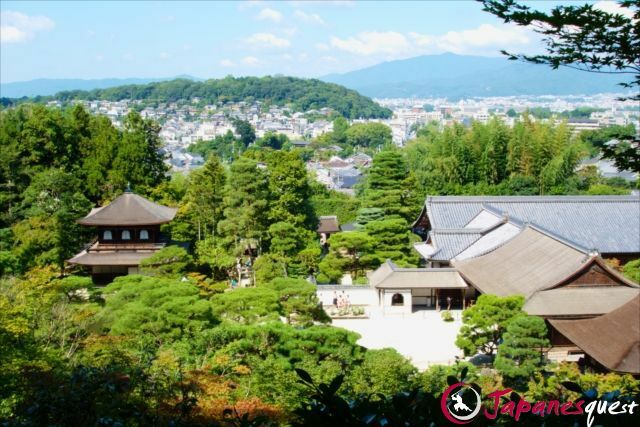 The more you get to know Kyoto, more you will come to enjoy and appreciate Ginkakuji. Why is it Called the “Silver Pavilion” Even Though There’s no Silver? There are several theories about this. The most likely one is because of financial problems. Shortly before Ginkakuji was built, the Onin war had been taking place for a decade. 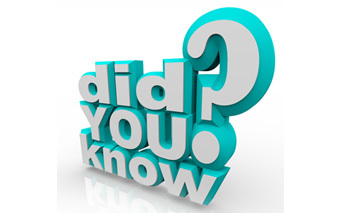 By the time the war was over, the government, the Ashikaga shogunate, was suffering a serious deficit and could not afford the budget to cover Ginkaku with silver.